Do you know what this tree is? Although this is not a typical view of this tree, this photo should give you everything you need to identify it. I will give you one hint. This is a not uncommon tree in Pennsylvania. Good luck! 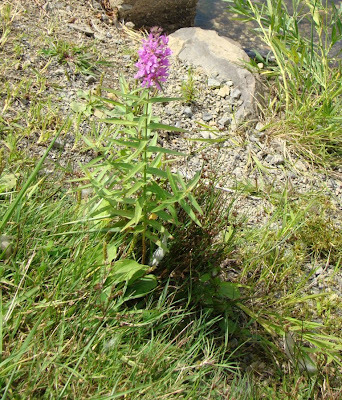 I believe this flower is purple loosestrife, yet another of those invasive plants that take over when they arrive. I found the plant this past weekend at the nearby state park. As the years go on, I am ever more surprised at how many of the flowers I'd always assumed were native turn out to be invasive species from someplace else. So many of these invasive plants are also pretty ones, which I'm sure contributes to the difficulty of eradicating them. No one minds pulling up some ratty-looking little weed, but a pretty purple flower? That's a lot more difficult, isn't it? 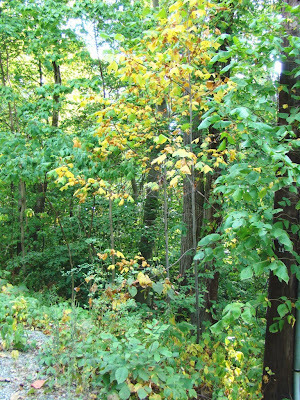 Right around the cabin, the dry weather continues, with ever more trees turning a not-quite-bright yellow. It really does look like autumn, and every now and again I have to remind myself that it's not. Perhaps tonight, perhaps tomorrow, perhaps I will see some rain. Last night I heard the foxes barking down near the old pond. At least the local animals don't have to worry where they will find water. The snowmaking ponds hold plenty. Animals on the next mountain over or further away are less lucky. Now, I'm starting to see the smaller streams dry up, too. We need an invasion of rain here, or at least a mini-invasion. The yellow color you can see in this photo was taken on Sunday morning. The yellow is not from an early fall color change. This same scene is repeated all around Roundtop and beyond right now. On the top of the hill next to Roundtop, perhaps 40% of the mountain is yellow, so that it does look like fall, but it’s not. The color change is caused by dry weather. Until August 1, this area was having a normal year for precipitation and was perhaps even a tiny bit ahead of normal. Since August 1, I haven’t had a drop of rain, and this yellowing of the surrounding forest is the result. Every day as I drive home, more trees are turning yellow and withering. August has not been hot, hazy or humid, but it sure has been dry. I’ve never seen yellowing like this before, and I’ve certainly never seen it in August at all. I do remember several dry years when I have seen some level of yellowing in the second week of September, when a little breeze brought down all those withered leaves and made it look like late autumn for an hour or so. I’ve never seen yellowing from dry weather to this extent. And late August is a long way yet from the second week of September. As you can see from the photo, it’s not just the trees that are yellowing, but the forest understory too. Grass crunches underneath my footfall and disintegrates. This morning I smelled wood smoke and nearly had a panic until I realized it was coming from a neighbor’s fireplace--last night was under 50 degrees on the mountain. Rain has occasionally been in the forecast during August and is in the forecast even now, but each time, the chance has evaporated before the day arrives. Even now, the precipitation chance is no higher than 30-40%--hardly enough to start a countdown or breath a sigh of relief that an end to the dryness is at hand. But I hope this time, the rain will come. 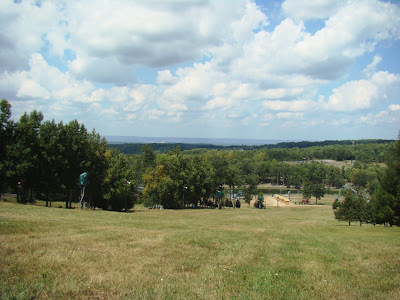 This view is from the spot where I'm planning to do my fall hawkatching this year at Roundtop. Yesterday was a beautiful day, if not ideal hawkwatching weather. Good hawkatching weather is usually not good weather. Hawkwatchers call days like yesterday "bluebird weather." Good hawkwatching usually comes the day after a cold front has moved past. The day will usually have a strong northwest wind and usually brings a lot of hawks. The one species of hawk that really hates strong winds are Broad-winged hawks. They prefer little to no breeze, and they like skies that let them cruise strong solar thermals. When they get that, they can pretty much fly higher than hawkwatchers can see. Hawkwatchers hate that. This view looks to the north. 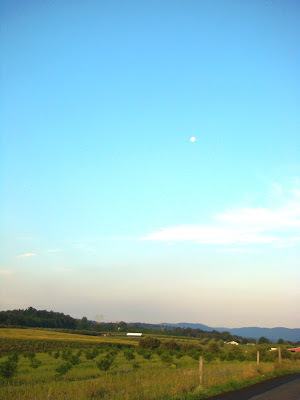 Many hawks migrate by sticking to the ridges that are in the distance across the valley in this photo. 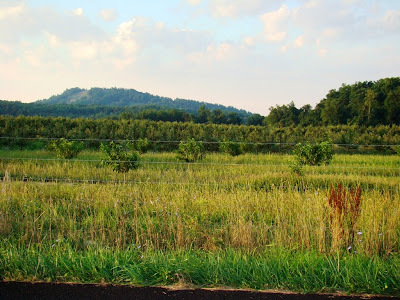 The ridges from from the northeast to the southwest, but depending on weather, hawks and other birds will also leave the ridges and cross over Roundtop. That's what I hope for. If you click on this photo and look at the larger view, you can see some yellowing of the trees, especially those in the left and center area. That's not fall color change. It's withering from the dryness that this area is currently experiencing. I'll have more on that tomorrow. Yesterday was not a big migration day anywhere--not at Roundtop and also not at the ridge sites. It's still too early in the season for a really big day, and yesterday's weather was really too nice for hawks. It was plenty nice enough for Dog and me to sit out on the hill for a few hours, though. I saw 3 black vultures heading south, a large number of turkey vultures and 2 red-tailed hawks. 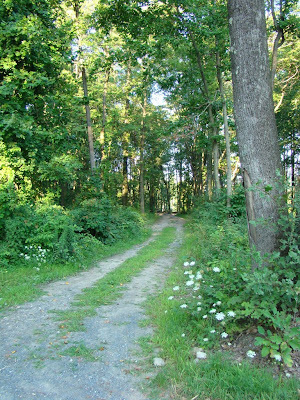 Those who have been reading my blog for a while may remember the experiment I did in the woods behind my cabin this spring. Each week I dutifully took a photograph of the same spot so I could see how the forest changed from week to week as spring progressed in the woods. I took photos starting from when the snow melted although the way through the end of spring’s arrival. Eventually, the foliage didn’t get any more lush from week to week and I ended my experiment (see blog labels titled Experiment for details). My original idea was to document just how dense the foliage gets. Last night I decided to reinvestigate my spot, as I’m thinking I may try the same experiment in reverse during the autumn. My first realization as I trudged out back is that I chose the wrong spot for my original experiment. I now have the battle scars to prove it. 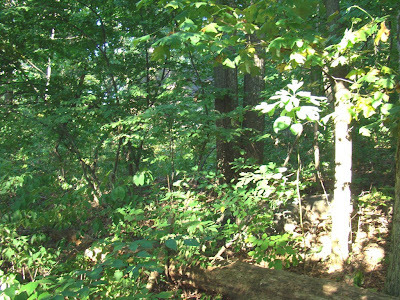 The forest right behind the cabin is far more densely grown than the spot I chose to photograph. That’s what today’s photograph is. This is what I stumbled, hacked and scraped through to reach my experiment spot. I am actually not more than 50 feet behind the cabin. You can (sort of) see the roof line. Well, I can see the roof line because I know where it is. Trust me it’s there. When I actually got to my experiment spot, it didn’t look any different (yet) than it did this spring. But compared to the dense foliage in the photograph in front of you, it looks like a desert. I guess that’s what experiments are for. You find out how to make the next one better. 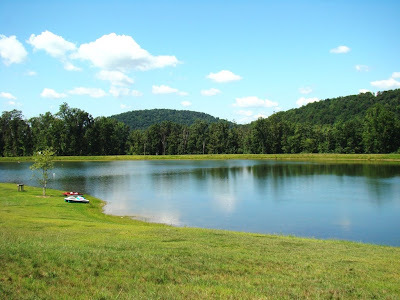 I'd love to be sitting by the pond, staring into the blue sky, watching the clouds roll across the sky, and not having one place I needed to go or one thing I needed to do, but today is not that day. So for today, I'll leave you with a view of the mountains and a hope that your day will be as quiet as this photo. Hawkwatches in the eastern U.S. are gearing up for the fall migration season. Several have been watching and reporting since the first of August. Another batch started around August 15. This new migration season is already turning into an interesting one. The perfect weather that much of the mid-Atlantic states is experiencing seems to be encouraging hawks to move. Yesterday, Bake Oven Knob, a hawkwatch north of Allentown, PA, saw 17 Bald Eagles. Twenty years ago, when the effects of DDT were still damaging the eagle population, that was not far less than a season’s worth of sightings. American Kestrels, which have been in a steep decline for some years now, are also currently putting in a decent showing. Waggoner’s Gap, PA, near Carlisle, saw 17 on August 16, and other sites have reported consistent numbers this week, too. Perhaps our smallest falcon will finally show some improving numbers. 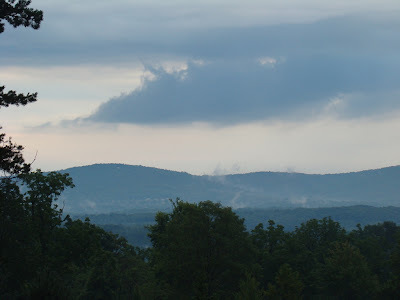 Last evening I was wandering around the slopes at Roundtop, trying to find a sitting spot where I can watch hawks. I finally found a spot that at least temporarily suits me. Trees along the edges of the slopes limit the viewing to the west, but I found a spot where a break in the trees at least gives me some view to the west. For several years after I first moved here, I automatically climbed to the top of the mountain for my fall hawkwatching. It wasn’t particularly satisfying. I didn’t see all that many hawks. Eventually I found out why. The typical path of fall migratory hawks around Roundtop is often from the northeast to the southwest, and though the view from the top of the mountain is wonderful, it isn’t the best place to watch hawks. Oh, I can see to the west from up there, but the birds often sneak past through the valley between Nell’s Hill and Roundtop. I’ve found I’m actually better off if I don’t climb the mountain but stay within a closer distance of the valley. The fact that the top of the mountain isn’t the best place for my local hawkwatching was brought home to me for the first time one year when I was down near the bottom of the mountain and a huge kettle of hundreds of Broad-winged Hawks fell out of a cloud in the north, circled once and then headed to the southwest. At that time Roundtop had a regular hawk counter on the hill, and he was starting to head off the mountain for the day. From where I was I jumped and hollered to get his attention, and though he looked, he never saw the birds. Since then I have searched for the "perfect spot" for fall hawkwatching. For several years I watched hawks from Roundtop’s north parking lot, which isn’t bad. The biggest problem there is that it’s lower elevation, and my views of the hawks are usually limited to small specks. So I realized I needed to get higher in order to have better views, but not so high that I couldn’t see over to where I needed to see. Maybe I’ve found it this time. I hope so. Now all I need is the time to sit there and find out. Yesterday I heard climate change predictions for the rest of this century that indicated the Midwestern U.S. might see temperatures rise towards and even above 125° during summer heat waves. Right now, that’s kind of difficult for me to imagine, especially as August 2008 has been one for the record books. It hasn’t been hot here. It hasn’t been hazy here. It hasn’t been particularly humid here. Boy, is this weather messed up! Nice weather in August may well be a first in my lifetime. If more Augusts were like this one, I might even learn to like summer! Of course, even this August isn’t perfect (but it’s close). At the moment everything is pretty dry, getting dryer by the day, and the chances for rain have so far all evaporated before arriving. I’m starting to see the forest understory of annual plants withering and shriveling. Dust clouds are common behind tractors or cows’ hooves. The leaves are turning a duller shade of emerald, a sure sign of late summer. They haven’t yet reached that shade of dull, brownish green that comes just before the fall color change, but they aren’t far from that. This morning as I left the mountain, the light was that of early morning--another sign fall is near. During early summer, the morning feels already half over when I leave for work. This morning the light was still soft and golden, the moon high in the west. It was the kind of morning where I would have been happy to just spend the day doing nothing more than staring at a horizon and watching the world go by. Saturday had the kind of spectacular weather you read about but too rarely get to see, especially in mid-summer in this area. The sky was deep blue, filled with puffy cumulus clouds, the temperature wasn’t hot. It was glorious. And I was hampered by about 10,000 interlopers invading the mountain for a music festival. But I couldn’t stay inside in weather like that. To do so would have been criminal. 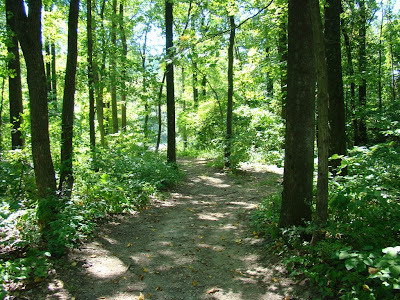 So I ventured out, skirted the edge of the festival and disappeared into the woods as unobtrusively as I could, all with the beat of heavy metal music in the background. In this area, summer is most typically hot, humid and hazy. Clear, low humidity days are usually reserved for June and the autumn months. It’s very unusual to have such pleasant weather in mid-summer, and I wasn’t about to let this rare chance slip away. So out the door I went. The first thing I noticed was how inviting the sunlight seemed as it streamed through the trees. The more typical summer haze deadens the brilliance of the sunlight somewhat, in addition to making me feel uncomfortable. Without the haze, the whole forest glowed with summer’s intense sunlight. Sometimes for me, experiencing unusual weather is almost like visiting some other place. The light in New Hampshire is different from the light in south Texas. Here, in Pennsylvania, I’m used to the normal range of sunlight, and an event as rare as Saturday’s weather makes me feel as though I’ve traveled to a different place, with different light and different possibilities. 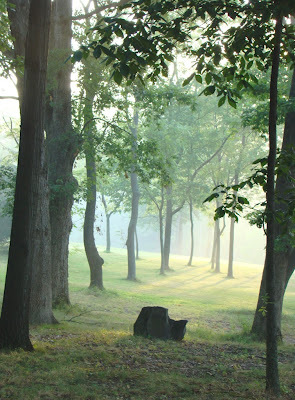 I wanted to post a photo that looks serene this morning, as my weekend will be anything but that. This is the weekend when the mountain turns into a latter day and more local Woodstock music festival. Thousands of people show up, and those of us who live near--both humans and animals--head for the hills. I'm going to be cabin-bound for a few days, as traffic in and out is more trouble to deal with than it's worth. I plan to use the time to catch up on a few projects I'm usually too busy running around to do. This morning on our walk Dog was already outraged by the sight of a few of the roadies running around in a dune buggy. Add dune buggies to the list of vehicles that he hates. So posting here will be on hold until the mountain returns to a more natural state. Look for me to be back online and out of my burrow again on Monday. Doesn’t she look innocent? Last evening it was a different story. Baby Dog and I had to make a trip to the vet so she could be rechecked after completing treatment for a positive Lyme Disease result. When we got home, armed with dog and dog leash, I apparently didn’t fully latch the front screen door, which normally isn’t a big deal. An hour or so after we got home, I’m watching TV and suddenly hear this huge ruckus out on the front deck—snarling and barking and lots of noise. I rush out there and am surprised to see Baby Dog outside and then I see the raccoon. It is on its back, claws at the ready, in a defensive posture. I grab Baby Dog by the scruff of the neck and pull her inside. The raccoon flees. I was afraid Baby Dog had been bitten—it sure sounded like a fight, but I checked her all over and didn’t find a scratch. This morning she was fine on our morning run, and I checked her again and still didn’t find anything. I think the raccoon was defending what it saw as its own private food source—the dish of cat food that I leave out for the feral cats that roam around at Roundtop. Last night, the cats hadn’t eaten all the food (only a few pieces were left). Raccoons in varying numbers and sizes are near-nightly visitors, cleaning up whatever the cats don’t eat during the day. They are also tough on my outside potted plants, as they sometimes dig them up looking for who knows what hidden in the potting soil. They’ve even been known to break into a bag of potting soil. This particular raccoon wasn’t a large one, but it wasn’t a baby either. 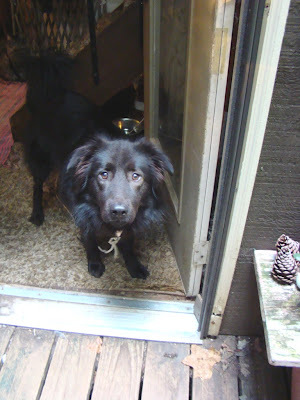 I think Baby Dog might have hit it with the front door when she went bombing outside, outraged by its presence. I had her tied to the front stairs at the time, as I’d just fed my own cats, and if I don’t tie the dogs when the cats are eating, well, that isn’t a pretty situation. So once outside she very quickly was literally at the end of her rope, which probably kept her from inflicting damage on the raccoon or being damaged herself. This is the same dog who only an hour before was too shy to take a treat from the vet’s hand after her test for Lyme Disease. But a raccoon on the deck is a different story. Next time, I’m just going have to pay more attention to that door every time I go in or out. My morning walks with Dog are now walks in darkness with a headlamp. I am already avoiding a section of our walk through the woods that’s hilly and rocky, as even with the headlamp the footing feels a bit unsafe in the darkness. Dog, whose eyes are better than mine in the dark, is confused by this change to our usual route. He will get over it, though, and by next spring he’ll act as though the longer walk is a surprise. This change in the amount of morning light is one thing about the approaching colder weather that I never seem to quite get used to. I soon will get used to the fact that our morning walks are in darkness, but I never quite get used to the idea that mid-August is the time when this occurs. I don’t know why that is so but it is. For some reason, my mind seems to equate early morning darkness with September. This is patently untrue, as the fading of summer’s morning light always occurs now. So why I expect in September is a complete mystery. And yet, somehow, every year, I am surprised that I am wearing my headlamp in August on our morning walks. I am starting to think that unlike Dog, I am simply not trainable. It was a dark and stormy night....and morning....and well, much of the weekend, actually. Saturday was nice, but a tornado warning on Thursday evening just added to the stormy pattern I'm seeing right now. The upside is that the weather has been much cooler than is typical for August, which is fine with me, except that over the years I've learned that a cool August usually means a hot September, and I can do without that during hawkwatching season. It's not just because I sunburn easily, either. Hot or warmer than average Sepember weather means this area doesn't get the northwest winds that brings fall hawks. They end up flying elsewhere or fly in a broad front so no one sees many hawks. Been there, done that, was hoping this year wouldn't be a repeat. And speaking of hawkwatches, the first hawkwatches are already starting their fall seasons. Hawk Mountain, Waggoner's Gap, Second Mountain, Raccoon Ridge, Johnson City and Corpus Christi are already counting a few hawks. August hawkwatching can have its own rewards. It's a good time to get the eyes "dialed in" and ready for those fast and furious days of September. If you go to a popular hawkwatch, not many tourists will show up yet, so the hours spent on the hawkwatch are quiet and enjoyable. August is also a good time to catch up on the lives of the few fellow hawkwatchers who will be on the mountain with you, so you won't be chatting about Johnny's graduation and miss something good flying by. All that will done with by the time September rolls around. Waggoner's Gap had a good early season day on Saturday, with 33 Broad-winged Hawks and 3 Bald Eagles among the 51 birds seen that day. Many sites won't start until August 15 and the rest won't start until September 1. Broad-winged Hawks will peak in this area around September 17-18, most likely. During a good flight, sites will see thousands of these birds. If you live near a Great Lakes site, you may well see tens of thousands of these small hawks. The third week of October is a good time to see the biggest variety of species, with 14 species of hawks possible. In this area I usually figure on October 20-21 as being a great time for that. It's not too early to plan a trip to your nearest hawkwatch. Before the season gets going full bore, I'll give you a few tips on what to take with your for a day at your local hawkwatch. 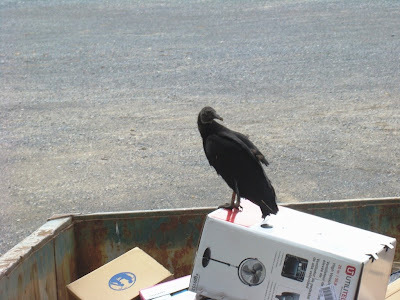 The Black Vultures are dumpster diving again. Maybe he or she was hoping that fan was still in the box, though it hasn't been that hot and how the bird was planning to plug it in, I have no idea. Oddly, the Turkey Vultures rarely dumpster dive, and I'm starting to wonder if the propensity for diving is a true behavioral distinction between the two species. I can almost see the field guides now. "If the bird is found in a dumpster, it's almost certainly a black vulture, as turkey vultures prefer to scavenge for carcasses along roads." It's been a slow day here at Roundtop. I guess you could tell that, huh? Sometimes it doesn’t take much to stop me in my tracks. 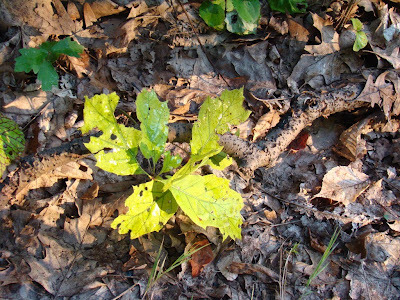 This morning, for a few moments, a small circle of sunlight caressed a tiny woodland seedling. It’s not even a pretty seedling, but one whose leaves are half-eaten by something. The plant is already yellowing and will likely not survive the summer. The eaten leaves make it difficult for me to even identify what it is. But the plant was wet with an early morning shower, and then bathed in the sun’s early morning light that followed the rain. Suddenly this tiny, even pathetic little seedling, looked beautiful to me. That’s what nature does for me. In an instant it can change my perception and make me see something in a different light. It even provides the light. My photo today is a male spicebush swallowtail. You can tell it’s a male by the blue spots on its lower wings. Females spots here are yellowish, not blue. Also, the female’s yellow spots on the upper wing edge tend to be smaller and less dramatic. 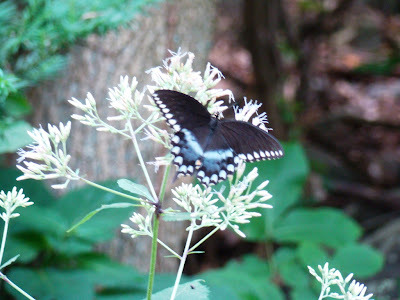 This summer has been a great one at the cabin for swallowtail species. I’ve seen every species of them that are possible here—tiger, zebra, pipevine, great and black. 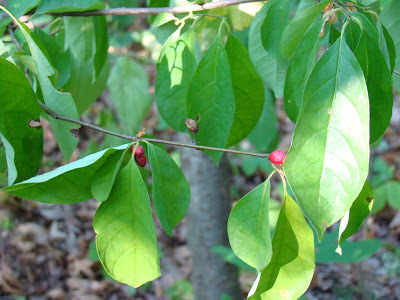 The spicebush is common here and throughout Pennsylvania. For me, the zebra swallowtail was the best sighting. I don’t see them very commonly. I also wanted to mention another speaker at the Kittatinny Roundtable (see yesterday’s post). Dan Kunkle has color-marked more than 300 Red-tailed Hawks over several seasons, and his results have led him to question the "local redtail" assumptions many hawkwatches make about redtails seen in the early part of the season. Many hawkwatches assume redtails flying around their sites in the early part of the migration season are local birds just fooling around and not migrating. Dan’s returns from his color-marked birds found that none of the birds he trapped stayed where they were color-dyed. The dyes were chosen for the time of year the bird was trapped, and even the early season "trappees" weren’t seen again locally, though many were seen elsewhere, sometimes very far afield. On Saturday I went up to Hawk Mountain Sanctuary’s Acopian Center for what was the 30th Kittatinny Roundtable hosted by the sanctuary’s senior biologist Laurie Goodrich. The roundtable gathers hawk counters from sites along the Kittatinny Ridge to talk about and analyze hawk counts from the previous migration seasons. In the afternoon Laurie usually has a speaker or two talk about some of their research. If you’re a hawkwatcher or a hawk counter or just a hawk dork like me, it’s a fun day. This year two non-ridge hawkwatch sites from Delaware joined the fun. Hawkwatchers tend to be competitive about their preferred site and the hawks seen there. I’ve more than once known someone to count in horrible weather because they knew someone from another site would still be counting, and they didn’t want to miss seeing something. Sometimes one site will start counting earlier in the migration season in hopes it will give them more hawks than another site by the end of the season. And in cases where that other site does "beat" your own favorite site, there’s still plenty of ways to "win." You can always find one species where that other site didn’t see as many as your site. Or your site might have fewer counting hours but more hawks seen per hour. There’s always something. So the morning comparison of hawk counts is always fun. In the afternoon, Laurie started off with Chris Farmer, who’s one of the main guys working on HMANA’s raptor population index. He’s a real statistics kind of guy but still manages to make most of what he says understandable to non-statistical folks. His talk was about the impact of wind farms on raptor and songbird migration. Raptors and other songbirds apparently can’t see or at least have difficulty seeing the blades of the wind turbines, which are often sited along ridgetops. Since that’s where birds also migrate, the potential impact on populations of birds as the number of wind turbines grows, is of critical concern to hawkwatchers. Chris is looking at where the turbines are located, plus the area of the blades’ sweeps plus the preferred height of migration by species to determine which species are likely to be most vulnerable to the blades. Birds that fly the highest will be less impacted than the ones who prefer lower flight paths. One thing I learned is that a 90 meter wind tower sweeps about 1.5 acres of air. Right now, it looks as though smaller raptors, such as the already declining kestrel and the sharp-shinned hawks, are among the most vulnerable. I was especially interested in Chris’s discussion of the "non-lethal" impact of wind towers. Although birds can’t see the blades well, they can see the towers. Since many birds fly along ridges because the air around them produces updrafts that makes migration physically easier, avoiding the ridge because there’s a long line of towers atop them also creates problems. For example, a bird will use about 4 times the amount of energy during powered flight than during soaring. So if the migration path from Central America is lined with towers that the birds avoid, the trip will become even more fraught with difficulty than it is now. And how does that extra exhaustion impact breeding success, assuming of course, the birds survive a trip that’s 4 times more exhausting than it is today? Proper siting of wind towers thus become crucial, as we are all suffering from issues with energy creation associated with oil right now. Siting towers away from ridge tops and known migration paths is vital. And to know precisely where some of the migration pathways are, studies through several migration seasons are needed and should be required, though they aren’t currently. Some European countries also require that wind towers be turned off during days where migration is heaviest. That’s one way our daily hawkwatch count information could be a critical part of our future energy plans, though in the U.S. there’s currently nothing to require companies to turn off their wind towers. I’d like to think that kind of cooperation would be a possibility here, though, if only because a company would get a lot of bad press from one photo of our national symbol chopped in half by a wind turbine. It would be nice to think the wind companies would be environmentally aware enough to want to do that on their own, but I suspect national legislation would work a lot better. 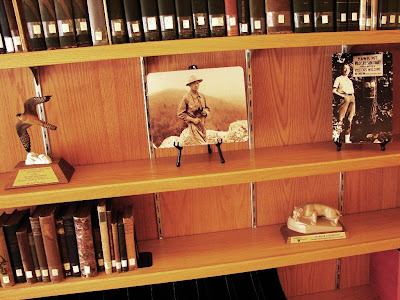 The photo in today's post was taken in our meeting room in the Acopian Center. The man in the center is Maurice Broun, Hawk Mountain's first curator, who with his wife Irma, in the photo to the right, single-handedly stopped the sport shooting of hawks on the mountain, which led to statewide and then national legislation protecting all birds of prey. It's still possible to find spend brass .22 shells up near North Lookout. Hawk Mountain became the first sanctuary for birds of prey in 1934. Baby Dog has discovered the joys of frog chasing. 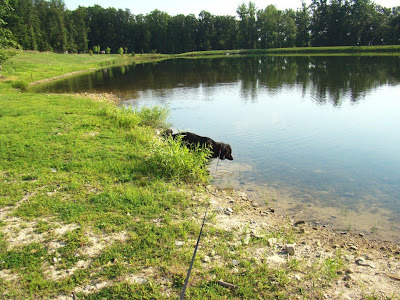 Last evening she gaily galloped around the edge of the pond, scattering frogs by the hundreds. I tried to count them but eventually gave up. Then I tried to estimate the number of them and that didn’t work too well either. Last year when I counted 73 frogs, they were easy to count. They leapt into the water one by one, right after the other, like some kind of frog "wave" like you see at a sporting event. This year there are so many of them that a dozen or more will leap all at once, making an accurate count virtually impossible. So I tried to estimate them like I do with a sky full of Broad-winged Hawks. It’s not the same thing. Frogs are gone quickly. Broadwings at least give me some seconds to pick a spot in the sky, look at the dots and try to figure out how many there are. My best guess is that there are something in the neighborhood of 300 frogs in this pond. After I got to a count/guess of 150, I was only halfway around the pond, and I gave up entirely. Baby Dog was too far ahead, racing off-lead along the edge. She seemed to really enjoy making those frogs leap into the water. She was trying to start a second lap around when I finally go her to come back.